Share the post "Gig review: HARD ROCK HELL BLUES – Pwllheli, 21-22 March 2014"
Kicking off the blues stage properly for the festival was Crowsaw, a hard hitting 3 piece blues outfit from South Wales whose riff driven blues rock sparks a glimmer of life in the bleary eyed yet enthusiastic crowd. Rob’s raw vocals fit the no-nonsense blues rock perfectly and the band show their quality with a great Rory Gallagher cover and also play a number of tracks off their ‘Smoke and Feathers’ album. Onstage now strolls a guy I’ve seen many a times in his other band Bonafide and indeed he was finishing off the AOR stage tonight with them. Pontus Snibb has turned his hand to the blues and has released a new album ‘Wreck of Blues’, with Martin Ekelund (bass, Bonafide). 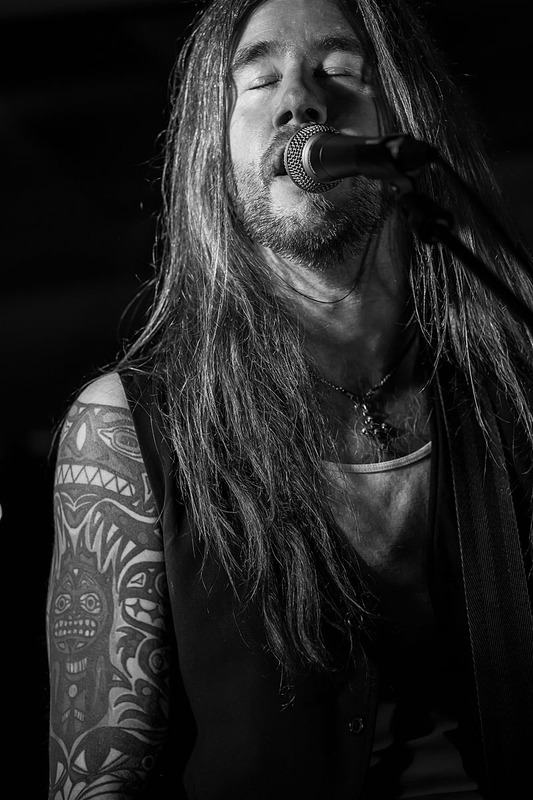 Pontus has a great blues voice, rough/raw yet also clear and a blues style similar to Stevie Ray. As well has his own stuff he puts in a few covers including ‘Baby Please Don’t Go’ and he goes down very well. In some ways the sound goes back to the early raw days of Bonafide. I saw Grainne Duffy last year in Ballyshannon rocking in front of a few thousand eager blues fans at the annual Rory Gallagher Festival and she really adds a welcome touch of glamour to the blues stage. She is an amazing blues guitarist and a great singer with a sound similar to that of Bonnie Rait with a nice rocky feel to the whole sound. She was well received by a small but very enthusiastic crowd. Big Boy Bloater presents the Blues Magazine show on Teamrock Radio but he’s also a extremely talented guitarist and songwriter. A tight big band style sound similar in a way to that of Jools Holland. Great keys by Dan Edwards made them a favourite with the crowd. I was sure that everyone who was here would know Band Of Friends featuring Gerry McAvoy and Ted McKenna from the original Rory Gallagher band but evidently not. Taking the role of axeman with the band is Marcel Scherpenzeel who for the past 2 years at least has being touring and a full member of the band and doing the job admirably. We are treated to an excellent set of Rory tracks that are played with a passion and authenticity that you won’t get anywhere else. This morning was definitely one for the blues as the inclement weather was making an appearance again. First to grace the Bonga Wonga stage this morning was the Brothers Groove, a 3 piece brummie based blues groove band nominated for 2 categories at the British Blues Awards earlier this year. Following them was the Brian Rawson Band, a more traditional sounding blues outfit and Brian certainly has the pedigree to take a higher billing. I would say that the guy up next certainly doesn’t need any introduction as he has been in the business for 40+ years and in bands across the many genres. The Pat McManus Band is a powerful touring trio playing his own blend of rock/blues with a Celtic twist. Whilst Pat is a formidable axeman he is also a very accomplished fiddle player and has a great vocal tone with hints of his Irish roots coming through. Backline is from the every cheery Paul Faloon (drums) and the cool Marty Mcdermott (bass). The extremely enthusiastic crowd are treated to an energetic blues rock set that included more chilled tracks like ‘Spirit of 66′ and ended with a step back to his Mamas Boys days with ‘Needle In The Groove’. With any Irish 3 piece blues rock band there will always be overtones of Rory Gallagher and Pat never hides the fact that he was and is a huge fan of Rory’s music. When not touring with FM, guitarist Jim Kirkpatrick has a few other bands on the go and Heavy Weather is one of them. Here he indulged his passion for the blues and a decent crowd witnessed a great set. Next up as replacement to the billed Graveltones were Henry’s Funeral Shoe an ideal substitute as they are also a 2 piece raw garage blues band and have a highly energetic riff driven set. I only caught a few tracks but they won over the crowd and certainly made me want to investigate their music further. 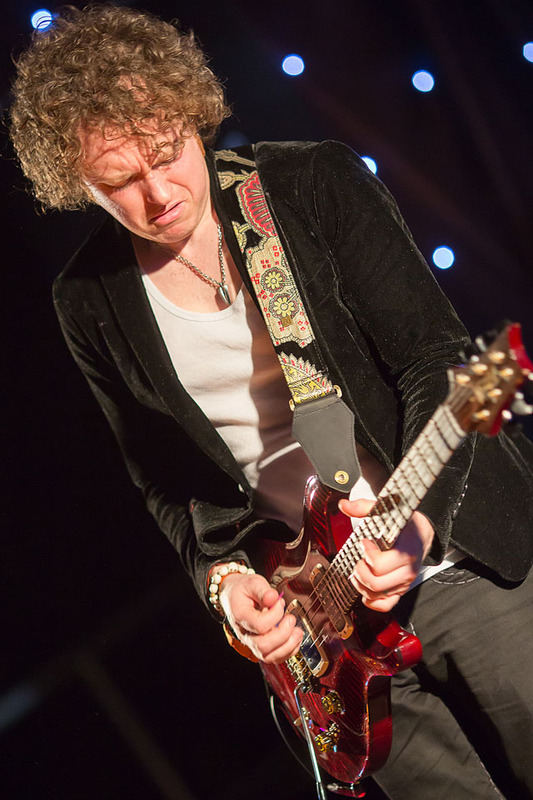 Simon McBride is another amazing blues guitarist, showing the Irish are perpetuating the Rory legacy and producing some of the best guitarists and songwriters around. We caught a great version of ‘Little Wing’ and ‘Dead Man Walking’ – certainly a master class in guitar and a great performance overall. The last live music of the weekend was in form of Vargas Blues Band. The band led by Spanish born guitarist Javier Vargas played a great set of blues rock to a rather drunk but wholly appreciative crowd. Some great riffs from Javier and also some great raw vocals from the rather Robert Plant-esque vocalist Gaz Pearson. Highlight’s from the blues stage for me were Band of Friends, Crowsaw, Pat McManus, Simon McBride and great new find…Henry’s Funeral Shoe. This entry was posted in All Posts, GIG REVIEWS, Special Events and tagged Band Of Friends, blues, Graine Duffy, Hard Rock Hell Blues, March 2014, Pontus Snibb, Pwllheli, rock, Simon McBride, Vargas Blues Band. Bookmark the permalink.